'Trust your new governor,' Omkar Goswami advises RBI Deputy Governor Viral Acharya. Viral Acharya, deputy governor of the Reserve Bank of India, has a knack for grabbing headlines. After the A D Shroff memorial lecture of October 26, 2018, where he forcefully made the case for central bank independence, he apparently stated during the RBI's central board meeting on December 14 that fundamental changes in the role of the board along the lines of the US Federal Reserve or the Bank of England would require a full-fledged reconstitution of the board. Presumably what Dr Acharya meant was that if the RBI is to be a wholly board-driven central bank, the present CB configuration, framework and rules of business won't do. There is nothing in the RBI Act of 1934 that requires the CB to perform only in a purely advisory capacity. On the contrary, section 7(2) of the Act states, 'the general superintendence and direction of the affairs and business of the Bank shall be entrusted to a Central Board of Directors which may exercise all powers and do all acts and things which may be exercised or done by the Bank'. According to the law, therefore, the CB is expected to play a supervisory and oversight role. Are procedures in place that allow it to effectively do so? The answer is 'Yes'. At present, the CB comprises the governor, his four deputies, a member representing each of the four local boards, seven directors nominated by the central government, and two government officials who are from the ministry of finance. While the CB must meet at least six times a year -- and once in each quarter -- additional meetings can be convened as needed. Except rate-setting, which is left to the members of the Monetary Policy Committee, much of the CB's supervisory work is delegated to its sub-committees. 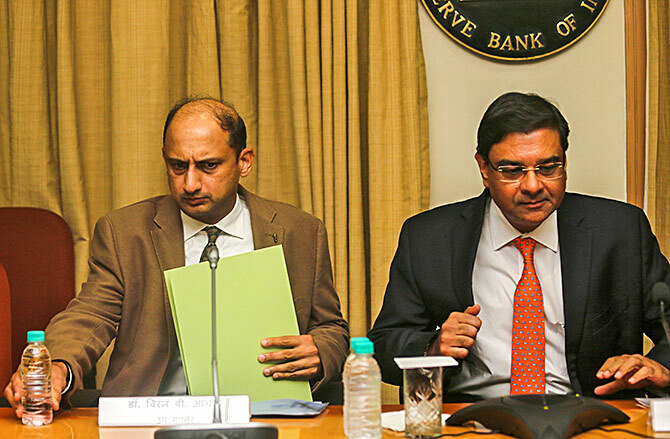 For instance, there is a sub-committee consisting of board members who, through a defined roster, meet every Wednesday to discuss, review and approve the RBI's various decisions and proposals. Notwithstanding the roster, any board director can attend and participate in these weekly meetings. My point is simple enough. To the best of my understanding, no significant decision of the RBI barring rate setting has been taken without the approval of the Central Board or its delegated bodies. These include important ones like early recognition of stressed assets of February 12, 2018 or the Prompt Corrective Action (PCA) framework of April 13, 2018. What, then, might be Dr Acharya's gripe with the present CB? As I see it, it is not about board processes, but that some directors are now questioning the management more than ever before on all sorts of issues. Though Dr Acharya doesn't explicitly say so, three of these are Subhash Chandra Garg and Rajiv Kumar representing the finance ministry, and S Gurumurthy of the Swadeshi Jagran Manch. To understand Dr Acharya's complaint, it is important to realise how key RBI decisions were taken in the past. Prior to Shaktikanta Das, three of the governors since 1991 were from the IAS with extensive stints in the finance ministry. Though not an IAS officer, Bimal Jalan was secretary of finance and banking; and C Rangarajan enjoyed close working relationship with those who mattered in North Block. These governors frequently conferred collegially with their finance ministry counterparts. There were differences especially on interest rates; but there was a clear line of communication such that, by and large, the RBI got what it wanted. This led to a situation where successive governors had the executive space to treat the CB as a de facto advisory and fact-sharing entity, contrary to its role under section 7(2) of the Act. Equally, over the last several decades, though many CB members represented some of the best industrialists, corporate leaders and policy specialists of the land, most were content in being seen as advisors and not as active fiduciaries. Things changed under the tenures of Raghuram Rajan and Urjit Patel, which saw bad loans assume horrendous proportions, necessitating tough action by the RBI. Here lay the rub. The RBI wanted very strict accounting and income recognition standards coupled with early detection and corrective actions that would necessarily constrain the operation of weaker banks. The government wanted some leeway. For all his brilliance, Dr Rajan was too wedded to the idea of unquestioned central bank independence. Thus, the kind of regular tête-à-têtes needed to seek the finance ministry's consent in an increasingly difficult time did not occur sufficiently enough during the second half of his tenure. But such was his persona that Dr Rajan got his way. Dr Patel's situation was far worse. Gaining office after signing the Faustian demonetisation pact, he was expected to be accommodative. He wasn't -- even less so than Rajan. Moreover, as the governor, he was uncommunicative with his colleagues, his staff, the public and civil servants of the finance ministry. If anything needed discussion, it was only with the finance minister or the prime minister. As the banking problems became larger with every passing quarter, the channels of communication between the RBI and the finance ministry effectively broke down. When the RBI started prescribing bitter medicine, it had no finance ministry allies to speak of. Only enemies. Things have changed with Das assuming the governorship. An IAS with solid finance ministry experience, he knows how to reach out to the government. He also knows how, when and what to speak. Here's my unsolicited advice to Dr Acharya. First, it will do him and the RBI good to keep his counsel in CB meetings and speak only on technical topics where he has expertise. Second, he must understand that many boards have to suffer the odd gadfly -- one who seems to know everything and hogs speech time. Good chairmen know how to handle them, as I am sure Das can. And third, trust your new governor. Just because he is from the IAS and doesn't carry a PhD from a US university does not make him unsuitable for the task. If anything, Das will pour oil on troubled waters, and save the RBI's reputation. Dr Acharya, place your bet on it. Dr Omkar Goswami is an economist and chairman, CERG Advisory Private Ltd.